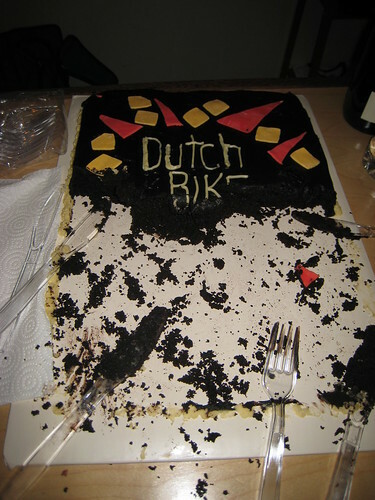 A Fantastic Night at the Dutch Bike Co.
We had a wonderful time at the Dutch Bike Co. Grand Opening on Saturday evening. Riding cool Dutch and Danish city bikes, drinking beer and eating brats while enjoying good people—what more could you ask for? How about Danish bikes and high heels, Maritime brews, and Val-conducted rides on the Conference Bike. We got to ride everything they had, though most test riders were sticking close and taking laps right out front. This seemed prudent on a dark night, considering the shop is in a seemingly isolated location right on Salmon Bay in Ballard. But for some reason, the two Conference bikes kept disappearing for half-hour stints. We couldn’t figure out what was going on until Val graced us with the last cruise of the evening. That’s when we realized the isolation is only superficial—the shop is really just a few pedal strokes from newly-hip Ballard Ave; Those missing party-goers were actually taking half-full conference bikes over to the club strip and then inviting the bar-and-show-and-gallery crowd to hop on for a few blocks. One group even brought some visitors from the foundry party back with them! The conference bike is a huge hit with just about every crowd. When we went out with Val (half tour guide, half train conductor) and shop co-owner Julie, we literally had standing room only. Seven pedalers plus one rider standing on the frame. Every time someone hopped off, two more riders ran up, vying to take their turn. The thing that surprised us the most: drivers who got stuck behind our admittedly slow going vehicle were more focused on their camera phones than their horns. One woman loved riding with us so much she almost didn’t get off as we rolled away from club zone, slowly but surely making our way back to Salmon Bay wrapped in a haze of good conversation. Even the trip back to our neighborhood was special—a three-Xtracycle convoy along a deserted Burke-Gilman trail. We rode with Val to Stone Way; he continued south while we climbed uphill over the sharrows, a warm glow of a great night following us all the way home. More photos in our Flickr set. This entry was posted in alternative transportation, bigger than here, bikes, seattle, sustainability and tagged ballard, party, seattle, xtracycle. Bookmark the permalink. Hey Tim and Anne, thanks for helping us celebrate and for the superb pic’s. Here’s one of you, Val and Julie returning from your Ballard Ave. expedition.